We remember Willy Burhen, a good pilot and a good friend, who shared his love of flying on this side of the mountains with many of us. In 2004 we lost Willy, and as we were still trying to cope with this, the idea was borne to honor his memory with an annual competition for the best soaring flight in Western Washington. It would be a fitting tribute to Willy and his indomitable spirit and we think he would approve. Thus the Willy Burhen Cup was started. The WBC is a rather informal competition for the best XC flights starting in Western Washington based on handicapped distance. The best flight of each pilot is used for the ranking. While documenting any flights with an IGC approved logger is highly encouraged, any reasonably documented flight is acceptable. Any pilot can try as often as possible within a given OLC year (which usually end in mid-October). Two pilots flying in a two-seater are counted as a team. Initially the flights were evaluated for up to 3 turnpoints using the Sports Class handicaps with bonus points for return flights and declared turn points. Since October 2007 the flights are evaluated according to the OLC Classic rules, which greatly simplifies the score keeping. 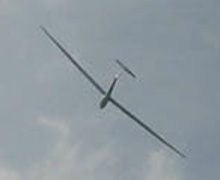 The OLC rules themselves changed in October 2010, with additional bonus points for an FAI triangle included in the flight. Thus the points for different years are not always comparable. The Willy Burhen Cup is quite literally a "cup" mounted on a board with plaques for each year's winners. 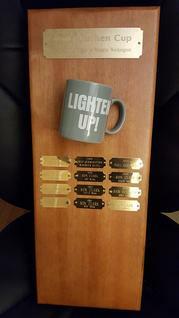 This cup - bearing the inscription "LIGHTEN UP" - was one of Willy's favorites and reflected his attitude in life. So, let's keep his spirit alive!